Gianni Garko stars in Lucio Fulci's unrelenting and incredibly well written supernatural giallo. Severin Films US R1 DVD release. Co-written by Fulci regular Roberto Gianviti, and Dardano Sacchetti, who would script many of Fulci's best known horror films over the next few years, and was working with the director for the first time, Murder to the Tune of Seven Black Notes takes a partly supernatural twist to the Giallo genre - this was something relatively common, but rarely done as effectively as the more orthodox Gialli. However from the opening moments, the script for Seven Notes in Black is simply perfect and comes to form a film that undoubtedly ranks in the genre's topmost echelons. We open with the suicide of Virginia's mother - a scene that would seem to be rather unnecessary, given that it plays no part in the film, but it is essential as it provides from the start that she really is Psychic, and means the audience know her visions are more than just bad dreams. The development takes the Giallo mystery elements to new places, no longer are we simply trying to work out the name of the killer, but the time of the murder and even the identity of the victim. The film moves along at a quite relentless pace, without any time to drag - a lot of subplots that could have slowed down the film are quickly passed over, and exposition is kept to a bare minimum - it all builds up to a lengthy climax that certainly ranks as one of the most nail-biting and tense in all cinema, with an ending that is simply perfect. Lucio Fulci is often derided as a simple hack, obsessed with gory effects, but watching this movie it is clear that he is on a par with the best of Italian cinema. While he shoots most of the film in a very normal fashion, the sequences of the vision are edited and filmed in a wonderfully dream-like style. Special effects are used lightly, and aside from some rather dodgy effects at the start, are very effective. The soundtrack is provided by Franco Bixio, Vince Tempera and Fabio Frizzi, the latter of whom would provide many of Fulci's distinctive 1980s horror themes, and gives the film a good edge, working particularly well in the vision sequences. Brazilian born Jennifer O'Neill is cast in the demanding lead role, and gives a strong performance - many of the better known female Giallo stars conveyed a lot of potent sexuality that would be very inappropriate for this role. Ruggedly hansome Spaghetti Western star Gianni Garko was rather unusual casting here, having only appeared in one other genre entry - Cold Eyes of Fear (1971) - but looks very effective in what is quite a brief role. Ida Galli plays Francesco's sister, while Marc Porell heads up a long cast of familiar faces with good performances all round. 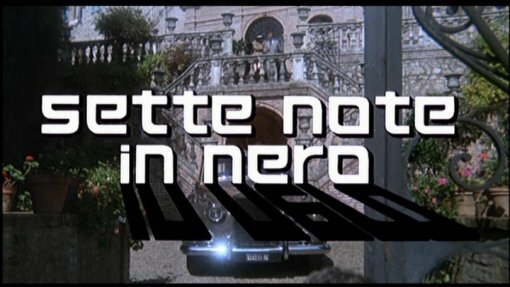 One of the best Giallo scripts ever written and boasting one of the best ending scenes in cinema, Murder to the Tune of Seven Black Notes is also treated to some good acting and a strong directoral turn from Lucio Fulci, making it a highly recommended film to all Giallo fans, and a must-have for anyone looking to explore the wider world of Fulci. Anyone famous in it? Gianni Garko - an Italian actor who became best known for his Spaghetti Western role as Sartana. Any gore/violence? A couple of bloody murders, with some shots repeated several times. Highly recommended to Giallo and Lucio Fulci fans. Picture quality is generally good, some very minor print damage is the only blemish. During the opening title sequences the print is slightly brighter and rather faded. Note: the review samples contained incorrectly processed audio which was too quiet to hear on many television sets, the discs have since been repressed, and the retail copies will all have corrected audio, which is said to be very good. Other regions? Available on DVD from France, including a 2-disc special edition. No English options (even though English audio is listed on the DVD case). An amazingly well written Giallo, boosted by some good acting and direction. Highly recommended for Giallo or Fulci fans. A good looking DVD release, with an interesting interview segment, it is only a pity that the lengthy extras from the French DVD could not have been licenced as well. Find more Lucio Fulci and Gianni Garko film reviews. All text in this review written by Timothy Young - 7th December 2007.